Are you looking for something sweet to serve on game day? With this dish you can change out with whatever fruit is in season. I mean come on y’all, what fruit doesn’t go well with chocolate? You don’t need to stop at fruit. You could add other stuff. If you can dip it in chocolate, it can go on a skewer. Sorry, I am not into that whole bacon dipped in chocolate thing. I am old school y’all, chocolate, I usually reserve for desserts. That is the way it should be. Cut the fruit into bite size chunks. 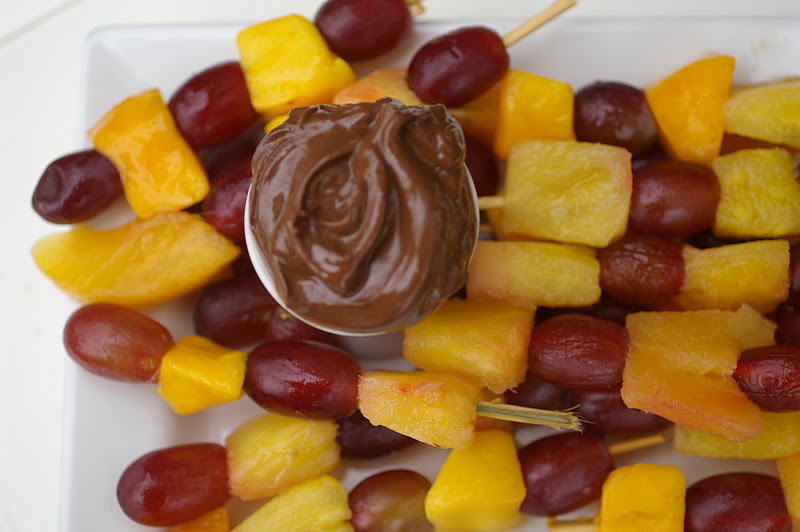 Thread a piece of each fruit onto a skewer and leave about 1/2 inch space at the bottom as a handle. Set aside. In a small saucepan over medium heat add chocolate, liquor, and cream. Whisk until the mixture is smooth. 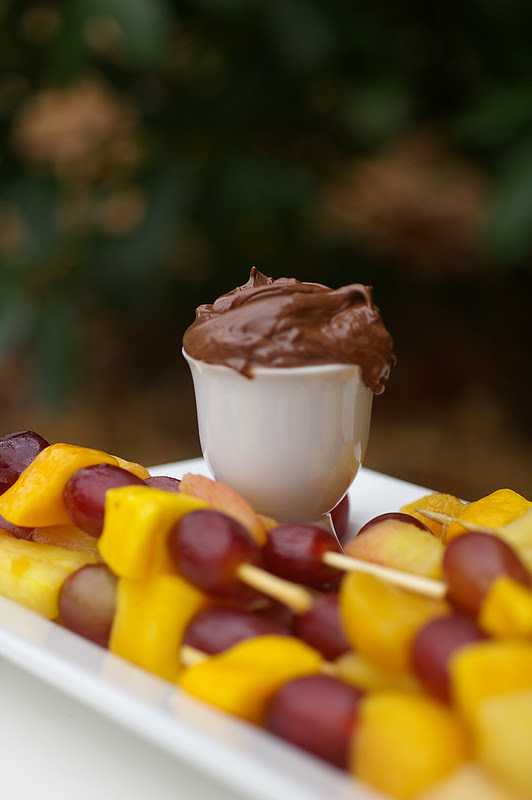 Spoon into a serving dish and serve as a dipping sauce with the fruit. That chocolate sauce looks soooooooo fluffy and light. This is a great dish for Super Bowl parties to offset all the fried, fatty, “not-good-for-you” foods. Oh.. these are not just perfect for the big game, but for any dinner party! Finger-licking good! Love the combo of chocolate and orange. The fruit kebabs look so delicious and fresh. This sounds so perfect for the Super Bowl. 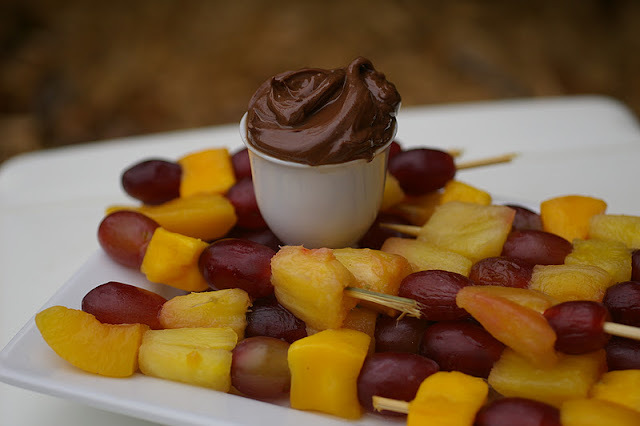 Healthy fruit with chocolate. With all the other fattening foods served on Super Sunday this is something everyone can feel good about indulging in. 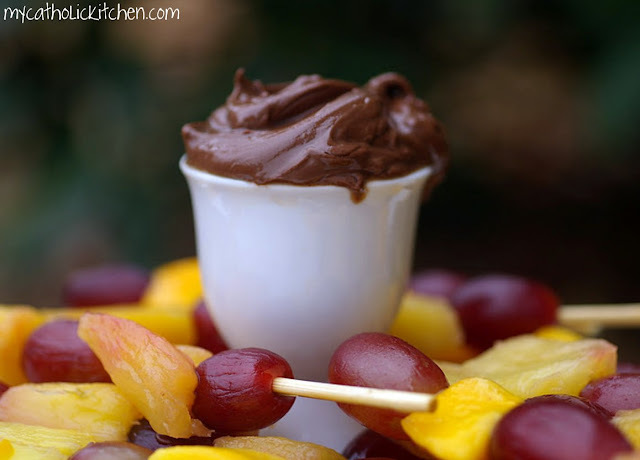 Of course I’d probably smother my fruit in chocolate! Dudette is telling me to make the ‘pudding.’ She thinks it looks amazing. I guess that’s good enough for me! Wow! Ver´´onica this look amazing!! love this chocolate and the fruits!! This is a great alternative to all the fried and heavy snacks you see! That chocolate sauce looks amazing!